Tuna: Size (and a few other things) Matter! Tuna fish is one of the most well-known fish. But, it has got a lot of bad press lately. What do you need to know before you buy your next tuna? I’ll bet you are wondering how much you need to know about the subject of tuna fish. I know I did before writing this article. “A tuna is a saltwater finfish that belongs to the tribe Thunnini, a sub-grouping of the mackerel family (Scombridae), which together with the tunas, also includes bonitos, mackerals, and Spanish mackerals.” (1) What I didn’t know before my research is that there are five tuna fish in the tuna family and their average size varies according to the fish. Those five include: albacore, Atlantic bluefin, skipjack, yellowfin, and bigeye tuna. My goal when starting to write this article was to decide which canned tuna was the healthiest and why. What I found is that there are more things to consider than just which brand is the best for me. 1. I had always heard that tuna was high in mercury and this was my main concern. What I discovered is that you can decrease the amount of mercury ingested by the species of tuna that you eat. Men’s Health Magazine offers insight on this difference, “….because albacore are typically larger, they also have higher mercury levels. So balance risk and reward, and eat only one 6-ounce serving of albacore a week. You can have 12 ounces of skipjack a week.”(2) So, the smaller the species of tuna, then the lower the rate of mercury in that fish tissue. [Click to Tweet] I also discovered that when eating tuna, the fattier pieces will hold more mercury because the heavy metals are stored in the tuna’s fat stores. 2. To buy the healthiest tuna, you also need to consider the packaging. Canned foods can become contaminated by the plastics that line the can to prevent the can from rusting. Bisphenol or BPA is what can leach into the foods causing harmful effects if over-consumed. “BPA kills rats in laboratories even at smaller portions, like 1,000 times less than what an average American consumes per meal. I hope soon FDA would do a U-turn on this and come clean and tell people about the harm to humans caused by BPA like they do periodically about drugs which they have claimed for decades to be safe, only to tell us now that they were not safe. I just hope it does not take decades before they try to protect the public against BPA. BPA is a toxic chemical that causes hormone imbalances and wide variety of health issues ranging from hypertension, aggression, obesity to cancer and heart disease. Based on FDA 17% of the American diet comes from canned foods yet there are no regulation or safety standards regarding the amount of BPA in canned foods. A study by Environmental Working Group shows that more than 50% of cans with brand names have toxic BPA in them.” (3) Next time you buy tuna in a can, look for the BPA free symbol to ensure that it is a healthier option for your body. [Click to Tweet] Another option is buying tuna fish in a plastic bag because it is more likely BPA free. 3. You must also consider when buying tuna whether it is packaged in oil or in water. Typically the oils in pre-packaged tunas are not healthy and the better option would be to buy the tuna in water. 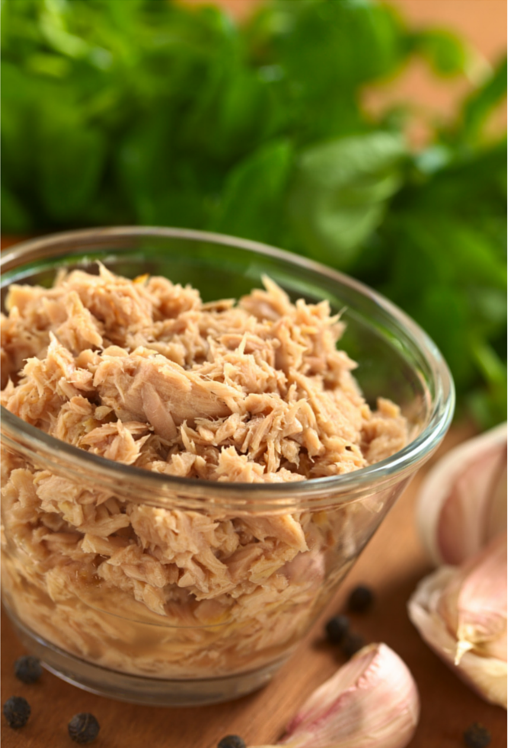 If you would like to add oil to your tuna, choose healthy oil such as extra virgin olive oil and add it yourself. So next time you are considering buying a tuna salad for lunch or buying a can of tuna from the store, think about all the considerations and decide what is best for your body. Graham, Jeffrey B.; Dickson, Kathryn A. (2004). “Tuna Comparative Physiology” (PDF). The Journal of Experimental Biology 207: 4015–4024.doi:10.1242/jeb.01267. Retrieved 20 September 2012.